.... Aggudey shot himself in the foot .... Dan Lartey drinks the wrong 'apeteshie' ... Mills should be in the classroom ... vote President Kufour out of power ... Osafo Marfo – Biggest 'Azaa' I've seen in my life Mr. Kofi Wayo, leading member of the Grand Coalition has described the performance of Mr. George Opesika Aggudey, the Convention People's Party's candidate, at the presidential debate, held on Tueday as disappointing. Speaking to the Weekend Agenda in an exclusive interview yesterday, Kofi Wayo said Aggudey shocked him with his view that women are just for the comfort of men, adding that, it was clear that Aggudey did not appreciate the role of women in nation building. “By that statement, Aggudey shot himself in the foot.” He said. Again, he said, Aggudey's plan for dealing with media excesses showed him as habouring dictatorial instincts, making him a potential threat to the democratic rights of free speech and expression. On Edward Mahama - the Grand Coalition's candidate, Kofi Wayo said he performed below expectation. “He did not fire on all cylinders.” Wayo said, but blamed Mahama's lack luster performance on the programme format, saying, it did not engender debate. He argued that, if the same questions had been thrown at all candidates, without variations, and opportunity created for the contestation of view points, Mahama would have no doubt shown his mettle. Wayo was however optimistic that the Grand Coalition candidate will win the presidential elections. On the National Democratic Congress candidate - John Evans Atta Mills, the outspoken Wayo said the man has carved a niche for himself, but this new image would not take him to the castle, and advised him to consider returning to his long cherished profession of teaching. “I could see he is a changed man, and I think he should be in the classroom,” Wayo suggested. 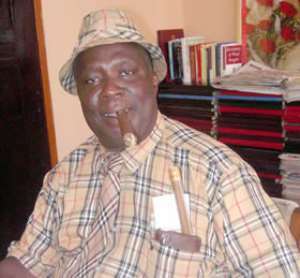 Reacting to a comment by the Chairman of the Grand Coalition, Dan Lartey, to the effect that, the dream of annexing the seat of government in the upcoming election by his party would be elusive, because he is not in the race, Wayo remarked: “I like uncle Dan, but the trouble is, sometimes he drinks the wrong akptheshie,” suggesting that Dan Lartey must have been under the influence of alcohol when he made that statement. Wayo urged the electorate to vote President Kufour out of power, since, apart from the size of the government being over bloated, he has failed in the management of the economy. He described the Finance and Economic Planning Minister Hon. Yaw Osafo Marfo as the “biggest 'azaa' I have seen in my life,” suggesting that, the Minister has been dubious in his handling of the economy of the country. He said: “Ghana has no economy to talk about. All we have is a begging economy.” He stressed. The Presidential debate is now becoming a feature in the democratic process of the country. Even though the two successive Presidential debates: in 2000, and 2004 were both boycotted by the incumbent presidents, Ghanaians are increasingly seeing the event as an opportunity to test the nerves and reasoning of those aspiring to the highest office in the land. A number of people the Weekend Agenda spoke to on the relevance of the Presidential debate to the electioneering process, said they anticipate that, it will soon become institutionalized, and when it does, candidates cannot run away from it, and get far at the polls.